Litter bin, trash receptacle, garbage can—there are many ways to say it, and many poor examples of the genre. Here we find a few examples that prove finding the perfect container for your trash isn't, ahem, a waste. Frédéric Perigot designed this trash bin with "the body of an aircraft," "a lid like a Frisbee," and a lid that closes with the "feel of a sedan." Which fulfills most, if not all, of our ideal trash can requirements. It's not cheap, but it will last forever. The round Frisbee version is €298; the larger, rectangular Mobil version with two canisters on the interior is €598. 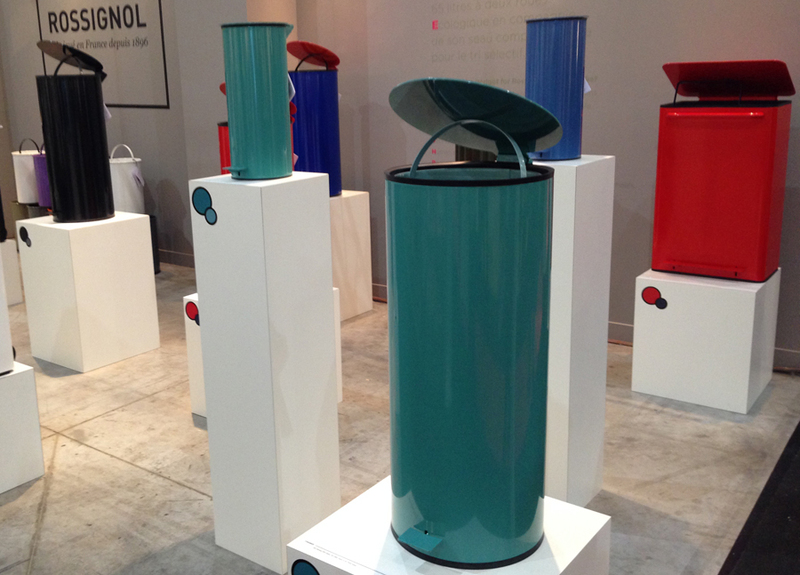 Brabantia, founded in the Netherlands in 1919, is a go-to for minimalist litter bin design. We like the Retro Bin's matte powder-coated finish (in very "now" hues of pastels, called "minerals" by the company), as well as the soft-close MotionControl Whisper lid and ten-year guarantee. Patent Ochsner, a household name in Switzerland, has been around since 1928. Their stainless steel bins are great for smaller spaces that don't generate a ton of trash, and the utilitarian industrial vibe of the classic bin is warmed up by an optional beech wood seat with felt cushion. About $285 at Patent Ochsner. Another European company making great out of waste is Westermann & Co, affectionately called Wesco; the Germany company has been manufacturing kitchenwares since 1867. The rounded, slightly retro Kickmaster style is available at Williams Sonoma for $280. Wesco has also introduced a double-canister Big Double Boy garbage can, made of extremely durable powder-coated sheet steel, that separates paper, glass, plastic, and other waste. An integrated damper ensures a soundless lid, and we like the oversized pedal and four color options. Though most of the contenders on our approved trash can list are European, one of our all-time favorites is made right here in the US of A. Sure, you might picture, say, a plunger when you think of Rubbermaid, but the company's Silent Defenders line of commercial waste bins is almost perfect. Very roomy, a soft close (hence the name), a sturdy wrap-around foot pedal, and a fuss-free industrial silhouette. You can find most sizes and colors on Amazon, starting around $150. This one is a more appropriate for dry waste, or a bathroom, than our larger kitchen garbage cans, but it's worth mentioning nonetheless for its sleek design and elevated materials. Menu Pedal Waste Bin by Norm Architects, $240. This design editor is a little obsessed with things trashy. Namely, she doesn't want to see or smell said trash, so it must be contained in a tidy area that's easy to empty. Other musts? Simple lines, easy to clean, a lid with a soft close, a sturdy foot pedal. And while stainless steel is certainly a thing as far as kitchens go, we have found that powder-coated metal resists smudging and fingerprints much better. After a recent European jaunt, in which we saw lots of amazing things while scoping out trash cans everywhere, we added a couple of entries to our list of acceptable receptacles.